200 Empty Backpacks purchased, 12 backpacks donated employees at Grant Regional Hospital (filled with supplies and checks to help with the project), and Grant County Social Services raised money to purchase 75 from Menards. When we work together we can turn backpacks and school supplies into miracles for many children before school starts. Becca and I spent the day organizing supplies into a school supply warehouse. Chairs became work tables and my feet hurt from all the walking. What do you do with all the FREE toothbrushes to get Walgreens Register Rewards? Stuff them in Backpacks and thanks to Our family Dentist we were able to put toothpaste and dental floss with each. Along with the trial size deodorants for the middle and high schoolers. Detamara kept us on track by giving us the backpack label, the notecard with the backpack number which after many years of missing labels is not placed in the front pocket to make sure we know whose bookbag it is. Becca's service dog Morgan thought backpacks are for riding in. Doesn't she use one in the stores? Two social workers from the county and two teens volunteered their Wednesday evening helping us pack the Backpacks until 8:00. Thank you for helping kids. 200 fully stuffed backpacks for kids in Grant County ready for School. Did you know a Toyota Sequoia can hold l60 Backpacks and not one more? The backpacks were delivered to social services yesterday. We will be sending extra supplies to the elementary school and the church for youth programs. 19 years ago, someone cared enough to adopt Kristy, Nathan, Ian and Marissa for school. When Becca was in the hospital and our family had fallen into poverty a Backpack Angel Tree filled the need. When you receive you pay it forward. 6200 times in the past 9 years. After the Storm God Showed me the Rainbow. Actually a double rainbow, but my little pocket camera could not capture it. It was the largest and brightest rainbow I have ever seen. Thank you God for caring me through the storms and your promise of the rainbow at storms end. Kristy is out of the hospital and home with her husband and two little girls. We could not head out, but her friends in Texas and their friends from Minnesota came to their aide and we thank them for helping with the girls and running the house. The infectious disease doctor came and confirmed Jim's diagnosis, Septic Shock caused from the absesses. Kristy once again had to come to terms with her near death experience and the Miracles of God's Healing. Prayers from across the country were answered. Thank you everyone for understanding my absence and neglect of my blog. Bargain hunting and posting doesn't become a priority when a Mom is in the midst of crisis with family on more than one front. Long story. Thank you for all the prayers, for the second time in the past few months we have a miracle. She is getting better, but there are still many unanswered questions so we need to keep praying. I got to talk to her for the first time since before she went to the hospital and it was amazing to be able to hear her voice. She told me that the doctors told her that there was a 50% chance of mortality with her sepsis. Prayers were answered. Thank you for being patient with me, my blog has been neglected with all the concerns with Kristy and the new baby, and life in the Yurcek world. Please say prayers that we can get Detamara stable and sleeping at night. She went in today for a medication adjustment and maybe we can get her back on track. Life in the FAS lane is sometimes a challenge. I have a house full of backpacks to fill on Wednesday and the social workers from the county and some of the hospital employees will be heading over to help get the project done and the supplies out the door and into the hands of children in need in Grant County. It has been hectic, sleep deprived and a worrisome praying time as of late. I cannot wait for some simplicity and the time to blog. The $5 off $20 coupons at Kmart will be expiring on 8-31. The new fall toys are coming in and combined with coupons it will be a great time to start or continue your Christmas/Birthday shopping. All the New Fisher Price Trio Bricks and Sticks are on sale $5 off any set over $10. Add the New Fisher Price $5 off coupon and a $5 off 20 for some amazing building fun. Pay $9.97 plus tax for all 3 Trio Sets. We are asking for prayers for healing for our daughter Kristy. The miracle delivery and survival of her and her baby Mahala is now complicated by a severe infection and she is in the hospital in Texas in the ICU. Pray for her husband Chris who is handling a l7 month old and a newborn and a wife in the hospital. We headed off to Piggly Wiggly and Walmart and I turned the trip into a Hands-on Math lesson. But most of all, I planned to cook big and save money by buying and cooking in bulk. Normally when we had 10 at home I cooked like this everyday for every meal, but I am returning to my roots to save money and now begin to cook ahead to save time. We found that 112 ounces of Kidney Beans was $4.40 at Piggly Wiggly and 120 oz. of Tomato Sauce was $4.56. Compared with $.98 for Bushs Kidney Beans 16 oz. per can (7) (the $.78 off brand were made in a factory which processed Wheat) and $1.46 for (6) 20 oz of Tomato Sauce. Buy buying the huge can of kidney beans we saved $2.46 and $4.20 for buying in bulk. We found the 10 lb tubes of 85% hamburger was $2.89 but the 90% lean was $2.79 in 3.5 lb packages and we bought 2 for the chilli and goulash which we browned with a fresh onions bought in a $1.99/3 lb bag. We saved $7.70 on the hamburger with it being on sale and got the 90% lean. We added in 4 cans of stewed tomatoes bought at Aldees for $.59= $2.19. Savings on the tomatoes over Walmart and Piggly Wiggly $1.60 for generic. 6 Meals of Chilli for 4 @ $2.81 each. We will be freezing the other 5 for easy meals. Total $11.22 for 4 Gluten-free Goulash meals for Becca and Myself for lunch ($1.87 each) Freezing our lunches in my FREE double coupon Ziploc Freezer Bags. Total cost $28.08 for 12 meals a 46% savings. and 6 goulash casseroles x 20 minutes: Time Savings 4 hours minutes buy cooking in bulk. It took Dee and I just under 40 minutes of cooking and 10 minutes to put in freezer containers and bags. Our Small Town Pamida is Doubling beginning tomorrow. match any store ad in the area and then I will use a doubled coupon for some incredible buys. I have been really busy lately and my coupons are disorganized. I will have to get them in check and hit Pamida next week and my Kmart will be doubling beginning the l6th. A week ago Friday, our county was hit hard with severe hail and winds. I received a phone call from our insurance agency on Monday asking if we had any damage. I had them send out an adjuster and today he inspected our home and our rental home (the home I bought for my friend and her adopted kids). Well...thank God I didn't raise my deductible to $1000 for each house instead of $500 each , I almost did when we renewed. Our insurance company will be on reshingling two roofs, replacing the siding on the l890's two story rental house and a new door at our house. I almost didn't have him check out our house, but when I saw the adjusters on my neighbors roof, Doc told me it wouldn't hurt to look at our house. Their are holes in in the shingles on the back side of the house. The tree shielded the front of the house. But they still have to replace the whole thing. Doc will have to ask around town about who to call who is reputable. With so much hail damage in the area, teams of roofers are coming in from out of state to try to gain business. We will only go with local contractors and with references and may have to wait until they have time. Then mother nature calls, it can be mixed blessings. For us a silver lining, two roofs reshingled, new siding, and a new door all for $1000. The hail damage in the county has been devastating to the farmers (we live in a agricultural county) but the hail has become an economic stimulus for the car repair dealers, the motels as teams of insurance companies, adjusters and roofers are filling rooms, the home improvement contractors are going to be busy. I found the Betty Crocker Cake Mixes in early July and Becca has been busy making herself Chocolate Chip Cookies. They are really good and easy to make. I first found them at Hy-Vee $4.09 and the best price is at our small town Piggly Wiggly at $3.89. For those who don't know, I have Celiac Disease, so do both my parents, all but one sibling, my six biological children now all have inherited my genes. Kristy and Ian just joined the ranks of following a Gluten-free diet this year. 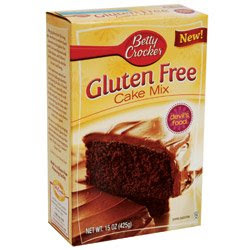 Get a FREE Gluten-Free Mix by calling General Mills at 1-800-446-1898 and choose option 4 to speak with a representative. Tell them you are calling regarding the gluten-free coupon. They will ask for your name, address and 2 simple questions. It's that easy, just remember to call during normal business hours. *Note not all Walmarts mark down at the same time. I had to run to Walmart (l8 miles) to return our redbox DVD's and ran into see if they restocked more Pull-up wipes. I discovered the clearance baby clothes were marked down even more. The racks were full of 1 piece sleeveless sundress one piece Child of Mine(Carters for Walmart) Onsies for a mere $1. Regularly $5.82 which is a deal compared to $12 at Carters. The little boy sleeveless and short sleeve rompers and two piece short sleeve shorts sets were also a $1. and a couple of matching ones in a 24 months for Kasja. I also bought more for shower gifts and to put away for the next one of my kids to become parents. 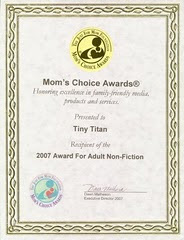 July 22, Kristy and her Husband Chris became parents of their second daughter Mahala. I posted that she had arrived, but there was a much bigger story. I had to give Kristy time to reflect on the miracle that spared my oldest daughter and my granddaughter. When they went to do her c-section, the doctors were shocked to find Mahala not cozy inside of the womb, gut in Kristy's abdominal cavity. She was right next to Kristy's stomach and intestines. Chris calls me and informs me on the discovery. Remember at the end of May I had to fly out stat for Texas to help Kristy? 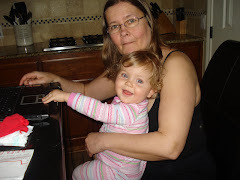 She had hurt her ribs when she felt something tear and was unable to barely breathe, much less lift my busy then l4 month old granddaughter Kasja. Her husband Chris was heading to Singapore for two weeks and I needed to help with Kasja as Kristy knew she couldn't lift her. Thank God I jumped on a flight on 48 hours notice, we now know that she probably didn't tear her rib cartiledge, but she tore open her uterus and my granddaughter popped out delivering her into the abdomin. Uterine rupture and it is deadly and it was like that for maybe a month or more. Talking with Chris and then calling Doc (my husband) who gets confirmation from his collegues that we were blessed with a miracle...two miracles. With talking with my Mom and sister (family physician) she tells me it is unheard of that all went well. The doctors can't find another case of this outcome, the baby completely out and the amniotic sac not rupturing, the mom not bleeding to death or the baby becoming hypoxic and dying. It is hard being up north in Wisconsin and having Kristy and Chris in Texas, I want to hug all of them. 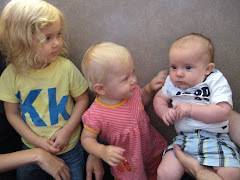 Kristy finally has posted on her blog to story of her delivery along with Mahala's arrival story and pictures. I apologize for neglecting my blog for a crisis hiatus, but between Kristy's delivery and supporting my best friend Lisa who is managing her 5 year old twins (one with severe Cerebral Palsy) while trying to care for her Mom who is on hospice dying from Cancer and my other friend whose son is struggling with transition to adulthood with his special needs I have been on the phone not searching for deals or being on line. A week ago Friday we had severe hail which blasted our county, our house and our rental house (which I bought for my friend who has 5 adopted kids when they were facing homelessness) roofs were damaged. Blessing, our cars are fine, my insurance will probably save me money getting us two new roofs for the cost of our deductibles. 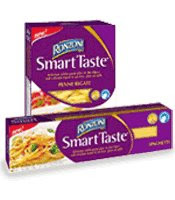 Get Ronzoni Smart Taste $1.00/2 and Ronzoni Healthy Harvest $1.00/2 here. 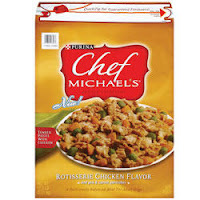 Chef Michael's 24oz bags of dog food are regularly priced at $4.49 at Target. 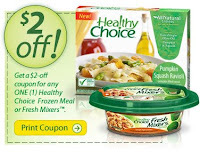 Use this manufacturers coupon for $3.50 off of any Purina dog food, combined with the Target printable coupon for $1.50 off Chef Michael's, and get FREE DOG FOOD. Or Try This Deal: Target is having a sale where you get a $5 gift card when you buy two large bags of Chef Michael's dog food at $10 each. Buy 2 for $20, use the above coupons and pay only $5 after gift card for 2 large bags of premium dog food. Roll the gift cards and repeat the deal as many times as you want to stock up! Here is the link for a $10 BluRay coupon. $19.99 for both movies after coupon and gift card. Save even more if you have any Best Buy Rewards Certificates. Don't forget to enter Becca's Giveway to win both Race to Witch Mountain and Tigger Movie. Today was Becca's 20th Birthday. Today has been a day of reflection and celebration and prayers of gratitude for my miracle daughter. I would have never have dreamed she would still be here and even greater how far she has come. I remember a time when I couldn't have thought about anything but today with her, much less 20 years. Happy Birthday Becca. Thank you for changing our lives. For those who do not know Becca, Becca as born with a severe form of Noonan Syndrome and was never expected to live to her first birthday. She is our miracle child who is my inspiration and my teacher who taught me the gift of today. 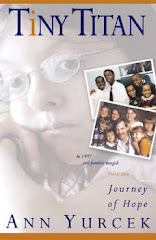 Read her story Tiny Titan, Journey of Hope. PS: Becca finished drivers training with an amazing 116% A++. Becca has dyslexia, dysgraphia and profound learning disabilities and she proved to the schools that they were really giving her "dumbed down work" instead of giving her technology to prove what she CAN DO. She takes her permit test on Friday. 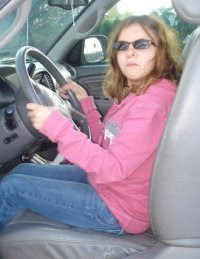 The picture is her behind the wheel of our Toyota Sequoia. A mighty big SUV for a tiny young lady. We began after lunch and started on the 3 Main Pieces of the Front Tower. Pages 11 through 12 completed. Becca is great at sorting pieces. Detamara has mastered putting in the deck screws. Becca drilling the holes lag screws. A few moments of figuring out what's next. Mom double checking the marks. Becca pulling the staples and labels off the ends of the boards. Detamara putting the puzzle together. Three finished pieces: The Front of the tower, the Back of the tower and the Roof. We had to put the pieces up on the pallet and move the rest into the garage its supposed to rain tonight. Join Sony Staycation Movie Rewards and print off the $2.00 movie coupons here. Best Buy has several Columbia Movies on $3.99 and after the $2.00 coupon you will pay a frugal $1.99 for some Summer Movie fun. *Buy 6 Columbia Movies at Target or Best Buy and enter the codes to get a FREE Movie. In honor of Becca's Birthday tomorrow (Monday 8/3), we will be giving away a SET of This Week's Movie Deal. Our miracle will be 20! To enter leave a comment on which is your favorite Pooh Character and why on the blog. Winner will be drawn on Monday August 10 at 12:00 noon central time. Bounce into Best Buy and Get a Grrrreat Movie Deal. Buy Race to Witch Mountain and The Tigger Movie and get a $10 Best Buy Gift Card. Best Buy has many movies Frugally Price at $3.99 this week. Use your $10 Gift Card and pick up other Family Friendly Movies. Shrek 2, Over the Hedge, Wallace and Grommit, Madagascar. Check Back Tuesday to see if Disney posts a link for any coupons as they have been on release day. Don't forget to check back Tuesday to see if Becca can sweeten the deal. This will be a good time to use your Best Buy Rewards point savings coupons if you have any. Enter your Disney Movie Rewards to earn free Disney Movies, DVD and merchandise. Last night we ran to Walmart to use the coupons I won at ebay to score some very amazing deals while stocking up on products we use. I still have 14 coupons left, I bought 20 on ebay for 5.00. Paid $19.00 for 20 of each. I used the $2.00 off when you buy Capri Sun/Koolaid Jammers and Nabisco Multipacks. I paid $3.15 for the 20 coupons I won on ebay. When I find an incredible deal I order extra coupons off ebay when the coupon clipping services are out. I pack lunches for Detamara for school. It saves money and she likes eating the same thing over and over again. We have plenty of nearly free Ziploc Snack Bags from Target to put her Chips Ahoy in. We are stocked for the school year for drinks. (200 Capri Sun Individual Drinks and Plenty of Cookies). Too Tired to Cook, Time for Celebration. We worked up an appetite and rewarded ourselves by having a late lunch at A & W.
Detamara enjoying being out. Dee is our homebody. The instruction book the most important part. 4 pages of wood cuts to make. We began on the pallet of 138 pieces of sale priced green treated lumber. The girls decided we were saving money and will stain it cedar instead of paying the extra for the cedar. Saving $750 on the project. Detamara and I had to sort out the two pallet of parts of the playground. Becca with her autism was cutting lumber using the mighty loud miter saw with her noise blocking headphones, I am amazed that she wanted to try. Jim and Becca cutting wood. We ALL got many chances in practicing the skill with 288 cuts to make today. Detamara and I reading the instructions. Becca and Detamara measuring and working on their project. This project has been great to practice measuring, figuring, planning and using their math skills hands on. Detamara admiring their work, 138 pieces of wood cut, 258 pieces labeled and neatly stacked by size, and she announced it looks like one big jigsaw puzzle. Detamara found a new job she can do, exterminator. She is petrified of bees, wasps and hornets. We solved the problem when one came near she shot it. Hopefully we empowered her to face her fears. Now it is time to relax with Morgan, her service dog. Becca did as much as she possibly could including carrying lumber pieces bigger than her. Mom's Thoughts: So many people judge kids with disabilities because of what they cannot do. With my kids it is about proving what they can do.